While looking forward to the proposed oil spill clean-up in Ogoni, it is pertinent that youths of impacted communities are involved in the process and of course monitor its progress. For monitoring to be effective, monitors need to be armed with relevant skills and knowledge for effective monitoring. 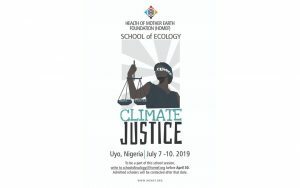 To this end, Health of Mother Earth Foundation (HOMEF) trains Ecological Defenders in Ogoni on the rudiments of hydrocarbons pollution cleanup 30-31 May 2019. HOMEF hosts Oilwatch Africa Conference/AGM 2019 and the maiden FishNet Alliance General Assembly 5-9 August 2019 in Port Harcourt, Rivers State, Nigeria. Contact us at home@homef.org for more details.